The present St. Bernard's rectory, built at the same time as the second and present church in 1875, both with Watertown brick, has a unique Mansard style roof. A French architect, Louis Charboneau, came to Watertown with a contract for the J. B. Murphy home, got other contracts here which served as a pattern or instigator for others to build this same Mansard roof style. 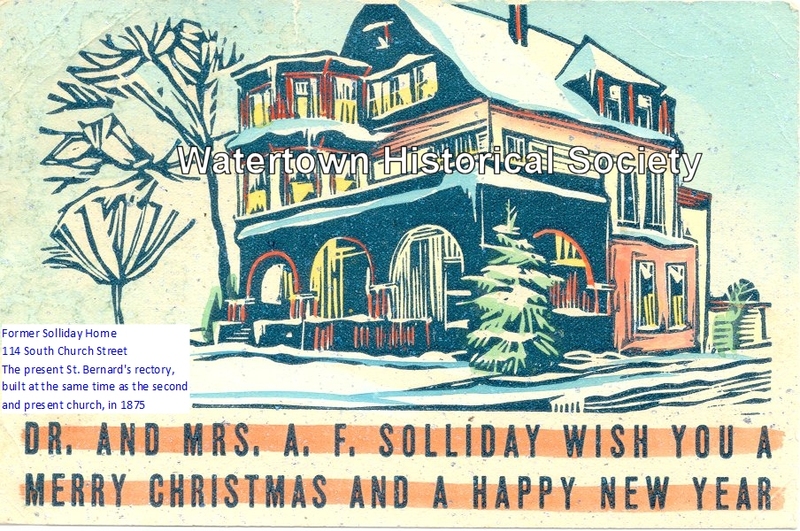 A home long known in Watertown as the Dr. A. F. Solliday home was purchased by St. Bernard's as a residence for the sisters of the church school. 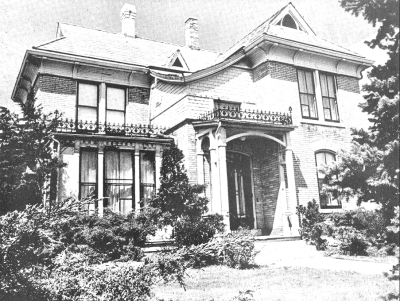 The parish celebrated an open house for this residence in June 1958. Dr. Solliday, a dentist, as a young boy living on Montgomery Street, had been a neighbor of the priests in the first small rectory. Dr. Solliday was a general in the Spanish American War. He was born in 1842, came to Watertown in 1868. He had one son, also a Dr. A. F., more often called Fay. The Sollidays built a new home later at 114 South Church Street. This Solliday house is the only good example of a Richardson style well preserved in Watertown. Henry Richardson was an American architect (1838-1886) noted for his strength, daring and skillful handling of materials. He designed many churches in the east and in the Midwest was the architect for Marshall Fields Chicago store. The convent was adapted from his style, though he personally had not designed it. Original land for St. Bernard's was donated by Patrick and Rose Rogan from lands secured by the Rogan brothers in 1836.
purchased his home for use as a Convent. Side yard of Solliday home. In upper left, the white house was the second convent for the Nuns. Originally they lived in the confines of the school. 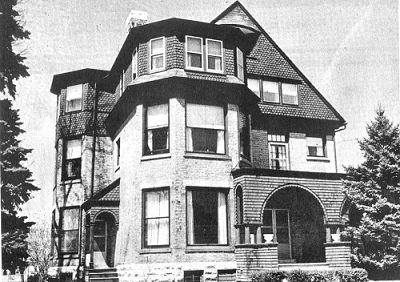 When their numbers grew, so did the need for housing so the parish bought what is now the home of Mrs. Mary Wagner [122 S. Montgomery]. 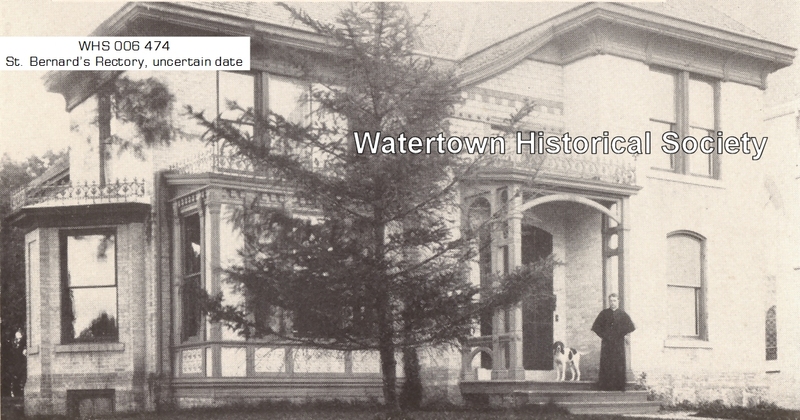 Within weeks of Dr. Soliday's death St. Bernard's purchased his home for use as a Convent. The rest of the picture shows that it was quite the showcase. A swing set that would have been used by the schoolchildren is seen. With the new school building not being there, there was a lot of room behind the school, Church and Rectory for them to play. It is reported that Dr. Soliday hated the Catholics, especially the children that attended St. Bernard's School. If there is any way that he knows that St. Bernard's purchased his home and that it became the home of their Nuns and is now the Rectory/Parish Center, he has rolled over in his grave at least 100 times. The Solliday House [present rectory] had been added on to many years ago when St. B’s first began to have multiple priests serve the church. If you look at the house’s side that faces the church, you can see where the addition was added. My great grandfather's uniform and my grandfather's dental chair are both in the Octagon House. My great grandfather built the 3 story house at 114 Church Street, next to the Catholic church. The stables were across the street and were later converted to garages when my great grandfather became one of the largest automobile distributors in the U.S. My Grandfather and my father grew up there. My Grandfather was a banker and Police and Fire Commissioner. After my Grandmother died firemen would come over to the house and start my grandfather's 1940 Buick until he passed away in the early 50's. The house was one of the most beautiful in Wisconsin. 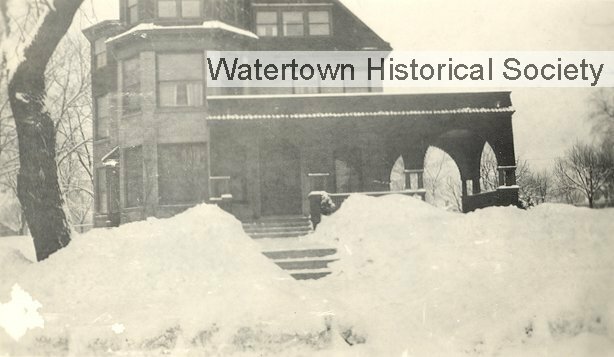 Several years ago I got a call from the Watertown Historical Society asking me to send them a picture of the original house with a windmill in the back yard. 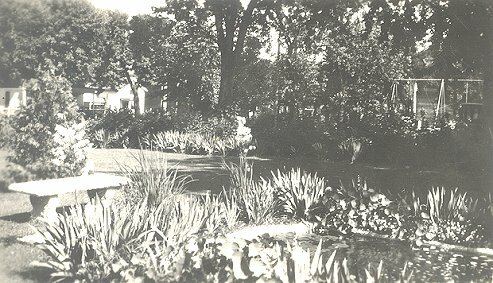 When the windmill was taken down the backyard was converted to a beautiful flower garden with a central mirror pond containing some of the first Japanese Goldfish to be imported into the U.S. When my Grandfather (an Episcopal) died he left the house to the Catholic church next door. It was used for many years as housing for nuns. 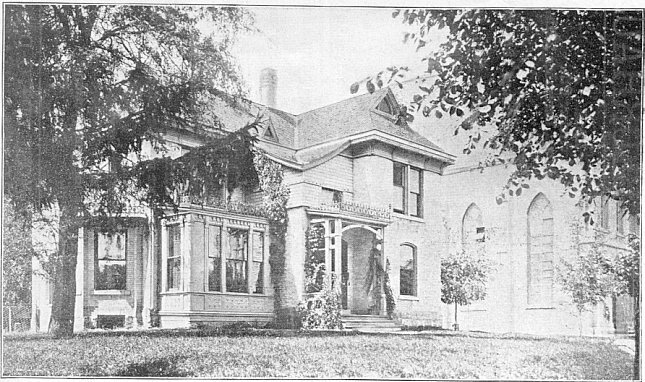 Rectory considered for nomination to the Wisconsin State and National Register of Historic Places.